Dr. Gurpreet Singh Lehal, Dr. Harvinder Bhatti (Punjabi University, Patiala, India), Ms. Sharon Corell (SIL International) and Zubair Torwali (Idara Baraye Taleem-o-Taraqi) visited CLE on 25th February, 2019. Researchers from CLE presented the current research projects being conducted at the Center and future research dimensions in the Applied Linguistics area. CLE successfully conducted the CLE Post-Graduate Certificate in “Prosodic Analysis Using PRAAT” from 25th January - 2nd February, 2019. Dr. Waqar Mahmood, Director, KICS, distributed certificates to all participants during the closing ceremony held at Room # 6, Auditorium Complex, UET Lahore. CLE has been awarded a research project titled, “Urdu Voice Enabled Assistive Technologies for Print Disabled Community of Pakistan”, by National Research Program for Universities (NRPU) of Higher Education Commission. This project will be executed in collaboration with Pakistan Foundation Fighting Blindness (PFFB). Research team from CLE demonstrated the Urdu TTS and Urdu ASR to honorable Provincial Minister for Higher Education, Punjab Raja Yasir Humayun Sarfraz, at 12th International Conference on Open Source Systems and Technologies (ICOSST), UET, Lahore on 19th December, 2018. Faculty members and students of M.Phil Applied Linguistics from English Department, University of Management and Technology (UMT), Lahore visited CLE on 11th December, 2018. Researchers from CLE presented the current research projects being conducted at the Center and future research dimensions in the Applied Linguistics area. Research team from CLE presented "Urdu SAPI voice" at the 5th National Conference on Development of Urdu Software, on occasion of International Day of Persons with Disabilities. This conference was organized by Pakistan Disabled Foundation (PDF) on 3rd December, 2018. Ms. Sahar Rauf presented "A Hybrid Approach towards Stress Marking in Urdu" and "Development of Proper Names Corpus for Urdu TTS" at the 4th International Conference of the Linguistic Association of Pakistan (ICLAP) 2018, held at Department of English, Fatima Jinnah Women University, Rawalpindi, from 18th-20th October, 2018. CLE has been awarded a research project titled, “Local Language Speech Interfaces for Banking Sector of Pakistan”, by Establishment of Technology Development Fund Program of Higher Education Commission. Virtual Force Pvt. Ltd. is the collaborating Industrial Partner. CLE has been awarded a research project titled, “Automatic Pakistani Postal Address Recognition and Parcel Routing”, by Establishment of Technology Development Fund Program of Higher Education Commission. TCS Pvt. Ltd. is the collaborating Industrial Partner. MoU signed between Desider Labs Limited (Desider) and CLE, KICS, UET, Lahore, on 4th September,2018. The aim of this MoU is to formalize an organizational link between the two organizations to undertake joint projects i.e. Consultancy provided by CLE, Project development outsourced to CLE and use of CLE Web Services. Research team from CLE visited University of Konstanz, Germany from 18th June to 22nd June, 2018 under the DAAD funded project titled, “Urdu Text-to-speech (TTS) system: Exploring Prosody of Emotions”. The aim of the project meeting was to share and discuss the results of a prototype corpus on Urdu intonation of various emotions such as happiness, sadness and anger in order to enhance the naturalness of Urdu text-to-speech (TTS) system. Ms. Saba Urooj presented “Urdu Intonation” in a one-day Speech Prosody workshop on South Asian Languages at the South Asian Language Analysis Roundtable (SALA-34) Conference, organized by University of Konstanz, Germany on 19th to 21st June, 2018. 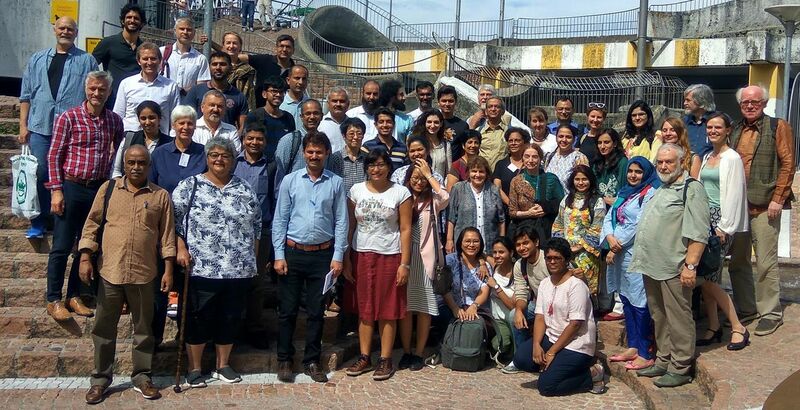 Research team from CLE attended the "South Asian Language Analysis Roundtable (SALA-34) Conference", held at University of Konstanz, Germany from 19th to 21st June, 2018. View Picture. Dr. Tania Habib visited the Chair of Multimedia Communications and Signal Processing Lab at the University of Erlangen-Nuremberg, Germany on 26th June, 2018 and Signal Processing and Speech Communication Lab, at the Technical University of Graz. Austria on 28th June, 2018. During her visits, she presented CLE research work and discussed various common areas of interest for joint research collaborations and funding opportunities especially trainings of CLE staff in the advanced areas of speech and audio processing. Dr. Tania Habib presented research paper titled “Urdu Speech Corpora for Banking Sector in Pakistan”, (Skype call) on 7th May 2018 at the 21st Oriental COCOSDA, Miyazaki, Japan. Mr. Muhammad Umar Farooq delivered a session on "Automatic Speech Recognition (ASR)" to the undergraduate and postgraduate students of University of Management and Technology (UMT), Lahore on May 10, 2018 held at Computer Science Department, UMT, Lahore. Professor Dr. Sarmad Hussain has received President's Pride of Performance Award on 23rd March 2018 for his distinguished contributions in the area of local language computing. A delegation from Seoul National University, South Korea visited KICS & CLE on 6th March, 2018. Dr. Kukjin Chun, who is the regional director of IEEE Region 10 Asia and Asia Pacific, represented the university. Researchers from CLE demonstrated their speech processing applications to the delegation. Delegation of faculty members from Speech and Language Pathology department, Riphah International University, Islamabad and E.A. Draffan from University of Southampton, UK visited CLE on 6th March, 2018 to discuss research projects of mutual interest. Faculty members of English Department, University of Central Punjab (UCP), Lahore visited CLE on 26th February, 2018. Researchers from CLE demonstrated their projects to UCP team. CLE and Lahore Grammar School, Johar Town, Lahore signed a License Agreement to use Urdu speech files synthesised by CLE Urdu TTS, on February 9, 2018. This agreement enables the school to integrate Urdu speech files with an RFID based student identity card solution being used at school dismissal time. Research team from CLE demonstrated the Urdu SAPI Voice integrated with NVDA Screen Reader at the Pakistan Foundation Fighting Blindness (PFFB), Islamabad on 18th January, 2018. Following this demonstration, feedback was gathered regarding its usability and enhancement from the visually impaired members of PFFB for further improvement. Research team from CLE demonstrated the Urdu SAPI Voice integrated with NVDA Screen Reader at the Ministry of Information Technology and National Information Technology Board (NITB), Islamabad on 18th January, 2018. Dr. Sean Pue, Associate Professor of Hindi Language and South Asian Literature and Culture at Department of Linguistics and Languages, College of Arts & Letters, Michigan State University, USA visited CLE on 4th December, 2017 and presented his research work focused on “Digital Humanities and Urdu Poetry". Researchers from CLE also demonstrated their projects to Dr. Sean Pue. CLE team presented the current research projects being conducted at the Center and future research dimensions in the NLP area to Dr. Tania Habib's Speech Processing Class of Fall 2017, MS (Computer Science & Engineering), UET, Lahore on 22nd November, 2017. Mr. Toqeer Ehsan and Mr. Samar Haider presented "Development of IOB-Tagged Corpus for Urdu" and "Urdu Language Identification in Online Multilingual Content" respectively at the 3rd International Conference of the Linguistic Association of Pakistan (ICLAP) 2017, held at NED University of Engineering and Technology, Karachi, from 12th-24th October 2017. A delegation from Germany, visited CLE, on 12th October 2017. Ms. Farah Adeeba presented the research being conducted at the Center and areas of future collaboration were discussed. Ms. Farah Adeeba presented “Text-to-Speech for Urdu: Understanding Intonation” the project funded by DAAD Germany at “3rd International Workshop on Pattern Recognition” organized by Al-Khawarizmi Institute of Computer Science (KICS), UET, Lahore on 11th October, 2017 held at UET, Lahore. Researchers from CLE attended “Regional Showcasing Event” for the 15th year celebration of Higher Education Commission (HEC) held at LUMS on 27th September, 2017. 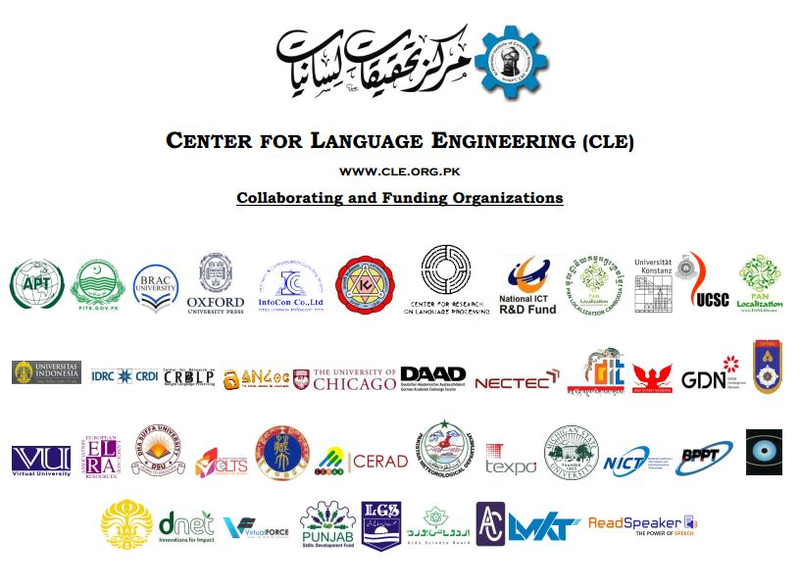 CLE team showcased CLE Urdu Nastalique OCR and Urdu Screen Reader projects at the event. Ms. Sana Shams presented “Digital Literacy through Localized ICTs” at the symposium “Literacy in Pakistan: Challenges of Digital World” organized by National Commission for Human Development (NCHD) and Japan International Cooperation Agency (JICA) on 8th September, 2017 held at Islamabad. Representative from Japan International Cooperation Agency (JICA), Advancing Quality Alternative Learning (AQAL) project visited CLE and discussed opportunities for future research. Dr. Nadir Durrani, QCRI, Qatar visited CLE on 28th August, 2017 and discussed research opportunities related to Natural Language Processing (NLP) projects with CLE team. CLE successfully conducted the CLE Post-Graduate Certificate in “Experimental Phonology Using PRAAT” from 4th - 12th, August, 2017. Dr. Sarmad Hussain, Head CLE, distributed certificates to all participants during the closing ceremony held at Innovation & Technology Incubation Center, UET Lahore. Research team from CLE attended a workshop on Prosodic Annotation of Speech held at University of Konstanz, Germany from 10th July to 16th July, 2017 under the project, “Text-to-Speech for Urdu: Understanding Intonation”, funded by DAAD Germany. The aim of the workshop was to share and discuss the Urdu tonal inventory, understand the complexity of Syntax-Prosody interface and annotate Urdu Speech Corpus accordingly. CLE is pleased to announce the release of “CLE Urdu Digest IOB Tagged Corpus”. The corpus contains a hundred thousand words of written Urdu language from a wide range of domains. The corpus has been designed for linguistic research and/or the development of language products. It covers a range of subjects including education, health, politics, international affairs, sports, business, humor and literature. CLE, KICS-UET, Lahore in collaboration with Society for Natural Language Processing, is conducting CLE Post-Graduate Certificate in "Experimental Phonology Using PRAAT” conducted by Dr. Sarmad Hussain. The deadline for registering in the program is 20th July, 2017, 3:00 pm. CLE is pleased to announce the release of CLE Pakistan District Names Speech Corpus collected from native speakers of seven languages i.e. Balochi, Brahvi, Pashto, Punjabi, Seraiki , Sindhi and Urdu. The data is recorded through mobile channel at a sampling rate of 8 KHz and digitization rate of 16 bits. Gender and district of origin of each speaker is also provided with the corpus. Age of the speakers ranges from 18 to 50 years. The data was collected in outdoor and office environments. The corpus has been cleaned and verified by expert linguists. The data is annotated at word level using CI SAMPA which is mapped on the Urdu IPA symbols. This speech corpus is useful for developing speaker and accent independent speech recognition technologies. Ms. Sana Shams gave a presentation titled “OER Use by Public School Students in Pakistan” at the Open Education Global Conference: OE Global 2017, Cape Town, South Africa from 8th to 10th March, 2017. CLE successfully conducted the “6th International Conference on Language and Technology 2016 (CLT16)" from 17th-18th November, 2016. The Vice Chancellor of University of Engineering and Technology, Lahore, Prof. Dr. Fazal Ahmad Khalid and the Director of Al-Khawarizmi Institute of Computer Sciences, Dr. Waqar Mahmood distributed shields to participants during the closing ceremony held at Al-Khawarizmi Institute of Computer Science, UET Lahore. Ms. Farah Adeeba presented research papers titled “Urdu Speech Recognition System for District Names of Pakistan: Development, Challenges and Solutions”, “Comparison of Urdu Text to Speech Synthesis using Unit Selection and HMM based Techniques”, “Spoken Dialog System Framework Supporting Multiple Concurrent Sessions” and Country report – Local Language Computing in Pakistan and Ms. Sahar Rauf presented research papers titled “Break Index (BI) Annotated Speech Corpus for Urdu TTS” and “Urdu Speech Corpus for Travel Domain” at the 19th Oriental COCOSDA Conference 2016, Bali, Indonesia from 26th to 28th October, 2016. Ms. Aneeta Niazi presented "Bidirectional Roman-Arabic Script Transliteration for Urdu Language" at the 2nd International Conference of the Linguistic Association of Pakistan (ICLAP) 2016, held at Institute of Languages, University of the Punjab, Lahore, from 18th-20th October, 2016. Research team from CLE, visited the University of Gujrat, Gujrat on 6th October, 2016, to conduct the first meeting of the project "Translation of Provincial Legislation (primary and delegated) of the Punjab in Urdu Language." Research team from CLE, visited Pakistan Foundation Fighting Blindness, Islamabad, on 8th September, 2016 to demonstrate the updated CLE Urdu Screen Reader 1.0.0 and conducted usability testing. Dr. Elena Bashir, Senior Lecturer, Department of South Asian Languages and Civilizations, the University of Chicago visited CLE on 18th July, 2016. During her visit, she was presented the research being conducted at the center. Research team from CLE attended a workshop on Prosodic Annotation of Speech held at University of Konstanz, Germany from 15th July to 25th July, 2016 under the project, “Text-to-Speech for Urdu: Understanding Intonation”, funded by DAAD Germany. The aim of the workshop was to share and discuss the Intonation Marking Guidelines, understand the complexity of Syntax-Prosody interface and design Urdu Speech Corpus for annotation accordingly. Research team from CLE, visited Pakistan Foundation Fighting Blindness, Islamabad, on 14th July, 2016. During their visit, they demonstrated the CLE Urdu Screen Reader 1.0.0 and members of visually impaired community tested the software and provided feedback. Prof. Sajida Haider Vandal, ex-principal National College of Arts and CEO of THAAP, visited CLE on 23rd May, 2016. During her visit, she was presented the research being conducted at the center. CLE successfully conducted the CLE Post-Graduate Certificate in “Computational Linguistics” from 27th May - 4th June, 2016. The Director of Al-Khawarizmi Institute of Computer Sciences, Dr. Waqar Mahmood distributed certificates to all participants during the closing ceremony held at Al-Khawarizmi Institute of Computer Science, UET Lahore. CLE, KICS-UET, Lahore in collaboration with Society for Natural Language Processing, is conducting CLE Post-Graduate Certificate in “Computational Linguistics” conducted by Dr. Sarmad Hussain. The deadline for registering in the program is10th May, 2016, 3:00 pm. MoU signing ceremony between Pakistan Meteorological Department (PMD) Islamabad and Al-Khawarizmi Institute of Computer Sciences (KICS), UET, Lahore, held at UET, Lahore on 24, March, 2016. Dr. Ghulam Rasul, Director General, PMD and Dr. Fazal Ahmed Khalid, Vice Chancellor, UET, Lahore, signed a MoU between PMD and KICS- UET, Lahore. The aim of this MoU is to formalize the link between PMD and KICS and to promote training exchange, workshops and research collaboration in the areas of mutual interest. 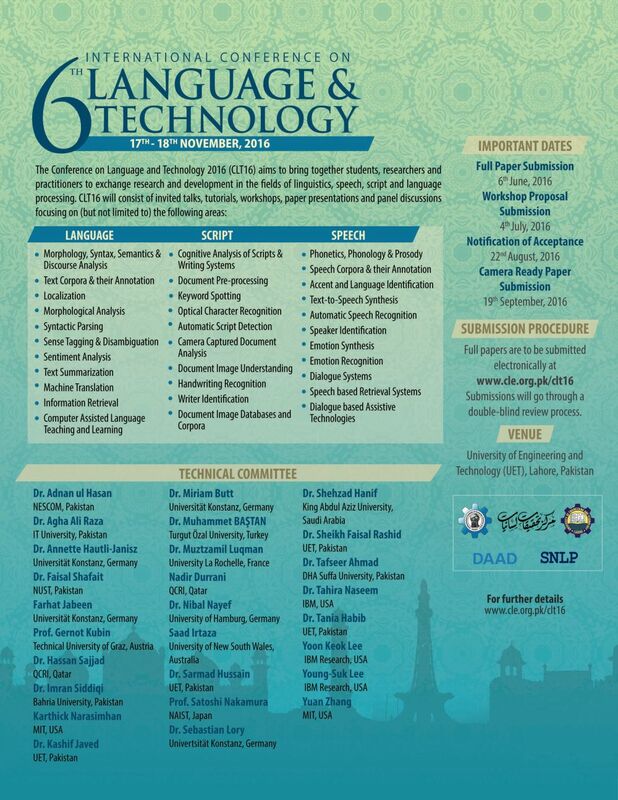 CLE is organizing the Conference on Language and Technology 2016 (CLT16) in collaboration with Society for Natural Language Processing, Pakistan (SNLP) at University of Engineering and Technology, Lahore from 17th to 18th November, 2016. Call for Papers. Mr. Muhammad Ahsan ul Haq presented research paper titled "Open Educational Resources Usage Trends among University Students of Pakistan", at the “3rd e-Learning and Distance Education Conference” held in collaboration with Virtual University of Pakistan & HEC, at Lahore, from 14th-15th March, 2016. Mr. Ehsan ul Haq has presented "Urdu Screen Reader" at the workshop on “Need for ICT Solutions for blind community” held in collaboration with National ICT R &D Fund at Pakistan Disabled Foundation, Karachi, from 7th-8th December, 2015. Prof. Dr. h.c. Andreas Dengel, Scientific Director and member of Management Board, German Research Center for Artificial Intelligence (DFKI GmbH) visited CLE on 3rd December, 2015. During his visit, he was presented the research being conducted at the Center and areas of future collaboration were discussed. Dr. Tania Habib presented research papers titled “District Names Speech Corpus for Pakistani Languages”, “Stress Annotated Urdu Speech Corpus to Build Female Voice for TTS”, “Development of Multiple Automatic Speech Recognition Systems in the Galaxy Framework” and Country report – Local Language Computing in Pakistan, at the 18th Oriental COCOSDA held at Shanghai Jiao Tong University, Shanghai, China from 28-Oct-2015 to 30-Oct-2015. Dr. Sarmad Hussain presented "Linguistic Resources for Data Driven Computational Linguistics" as a keynote speaker at the 1st International Conference of the Linguistic Association of Pakistan (ICLAP) 2015, held at Department of English, Kinnaird College for Women University, Lahore, from 7th-9th October, 2015. CLE and University of Gujrat signed a memorandum of understanding (MOU) on September 10, 2015 which aims to formalize an academic link and develop a collaborative forum between the two institutions for conducting training and workshops, collaborative research and development of linguistic data. This news has also been covered in Jang editorial. CLE in collaboration with National ICT R&D Fund, Ministry of Information Technology, Government of Pakistan is pleased to host a one-day workshop on "Facilitating Local Language Content Access and Generation using Human Language Technologies" to be held on 27th August, 2015 at University of Engineering and Technology, Lahore, Pakistan. CLE in collaboration with Pakistan Meteorological Department (PMD), has deployed the mobile based weather information service covering 139 districts of Pakistan at local landline number of PMD, Islamabad. The deployment of this weather information service is a pioneering initiative towards providing weather updates in fast and easy way to local population of Pakistan. Launch ceremony of this service organized by CLE, held at PMD, Islamabad on 13th August, 2015. Dr Sarmad Hussain and researchers from CLE attended a workshop on Prosodic Annotation of Speech held at University of Konstanz, Germany from 27th July to 31st July, 2015 under the project, “Text-to-Speech for Urdu: Understanding Intonation”, funded by DAAD Germany. The aim of the workshop was to share and discuss the Intonation Marking Guidelines, understand the complexity of Syntax-Prosody interface and design Urdu Speech Corpus for annotation accordingly. The researchers also attended a tutorial on intonation marking by German team. CLE has released an updated version (V1.3) of CLE Urdu Keyboard for Android devices. New feature of switching between keyboards has been incorporated in this release. Research team from CLE successfully demonstrated the Dialog Based Weather Information System to the Director General, heads of departments, researchers and staff after deployment of this service at the Pakistan Meteorological Department (PMD), Islamabad on 26th May, 2015. Research team from CLE demonstrated the first Urdu Screen Reader developed by CLE at the Pakistan Foundation Fighting Blindness (PFFB), Islamabad on 26th May, 2015. Following this demonstration, feedback was gathered regarding its use and enhancement from the visually impaired members of PFFB for further improvement. After incorporation of feedback, Urdu screen reader will be deployed at PFFB lab, in the upcoming months. Researchers from CLE, presented their research work at The 2nd Kashmir International Conference on Linguistics held at Azad Jammu Kashmir University, Kashmir from 4th-5th May, 2015. CLE in collaboration with Virtual University of Pakistan, has been awarded a research project titled, “Investigating the Impact of Open Education Resources (OER) on Secondary and Tertiary Education in Pakistan”, by International Development Research Center (IDRC), Canada. Details. CLE successfully conducted the CLE Post-Graduate Certificate in "Fundamentals of Acoustic Phonetics" from 13-21st March, 2015. The Vice Chancellor of UET, Lahore, Prof. Dr. Fazal Ahmad Khalid and the Director of Al-Khawarizmi Institute of Computer Sciences, Dr. Waqar Mahmood distributed certificates to all participants during the closing ceremony held at Al-Khawarizmi Institute of Computer Science, UET Lahore. CLE research team in collaboration with Islamia University, Bahawalpur and Saraiki Area Study Centre (SASC), Bahauddin Zakariya University, Multan conducted recording sessions from Saraiki speakers to cover accent variation in the Speech Corpus being developed for Automatic Speech Recognition (ASR) research. Dr. Sarmad Hussain and researchers from CLE presented research work and posters at 3-Day International Workshop on Corpus Linguistics held at International Islamic University, Islamabad, in collaboration with University of Birmingham, UK , HEC and British Council, from 2nd -4th March, 2015. CLE in collaboration with DHA Suffa University, Pakistan and University of Konstanz, Germany has been awarded a project titled as, “Text-to-Speech for Urdu: Understanding Intonation”, by DAAD Germany. This project will build upon the previous collaborative research conducted through the project titled as “Essential Linguistic Research Capacity and Resource Development for Urdu”. The focus is to learn the behavior of Urdu intonation and its relation with Urdu syntax to develop an Urdu language based text-to speech synthesis system. CLE, KICS-UET, Lahore in collaboration with Society for Natural Language Processing, is conducting CLE Post-Graduate Certificate in “Fundamentals of Acoustic Phonetics” conducted by Dr. Sarmad Hussain. The deadline for registering in the program is 27th February, 2015, 5:00 pm. Dr. Nadir Durrani, QCRI, Qatar visited CLE on 21st November, 2014 and presented his research work focused on "Statistical Machine Translation". Dr. Sarmad Hussain and Ms. Benazir Mumtaz covered by Express Tribune during the Conference on Language and Technology 2014 (CLT14). Their interview is published in the article "Bridging the gap: Computer scientists work together to create global village". Research paper titled "Multitier Annotation of Urdu Speech Corpus" presented by CLE researchers has been awarded with "NIVIDA Best Student Paper" award by the Technical Review Committee and Organizers of the Conference on Language and Technology 2014 (CLT14). Dr. Sarmad Hussain, Dr. Tania Habib and researchers from CLE presented research work, papers, demos and posters at the Conference on Language and Technology 2014 (CLT14) held in collaboration with Society for Natural Language Processing, Pakistan (SNLP) at DHA, Suffa University, Karachi from 13th-15th November, 2014. Details. Dr. Tania Habib, and researchers from CLE, visited Pakistan Meteorological Department, Islamabad on 6th August, 2014. During their visit, they discussed various collaborative opportunities of using PMD data for projects of mutual interest. Dr. Sarmad Hussain and Ms. Qurat-ul-Ain Akram (Team Lead, Urdu OCR project) will be teaching Optical Character Recognition module of Machine Learning Applications in Language Engineering course at the International Summer School in Advanced Language Engineering at Colombo, Sri Lanka. In addition, Ms. Benazir Mumtaz and Ms. Hina Khalid, researchers from CLE have also been selected to attend this summer school from 1st September-26th September, 2014. CLE is pleased to announce the release of CLE Urdu Keyboard for Android Based Devices on Google Play. Dr. Sarmad Hussain will be presenting at Asia Pacific Top Level Domain Association (APTLD) at Muscat, Oman on behalf of TF-AIDN. Dr. Sarmad Hussain has been invited to Editorial Board of ACM Transactions on Asian Language Information Processing (TALIP). CLE team participated in the Punjab Youth Festival Science and Technology Exhibition 2014 held at Lahore International Expo Centre from 28th February to 3rd March 2014. Details. CLE is co-organizing the International Summer School in Advanced Language Engineering II in collaboration with University of Konstanz, Germany and the University of Colombo, Sri Lanka, at the University of Colombo, Sri Lanka in 2014. ICANN is developing the Label Generation Ruleset (LGR) to support Internationalized Domain Names (and their variants) for the Root zone of the Domain Name System (DNS). Dr. Sarmad Hussain (chair) and Inam Ullah (member) are participating in the Arabic Generation Panel seated to develop the Arabic script part of the LGR as recently announced by ICANN. Details. Dr. Sarmad Hussain will be attending the Middle East DNS Forum and the follow up ICANN Middle East Strategy Working Group meeting from 3rd – 6th February, 2014 at Dubai. CLE is pleased to announce the release of alpha version of the online Urdu Nastalique Optical Character Recognizer (OCR) which will convert Urdu Nastalique document images into computer editable format. A. Sean Pue, Assistant Professor of Hindi Language and South Asian Literature and Culture, Michigan State University visited CLE on 27th December, 2013. During his visit, he was presented the research being conducted at the Center and areas of future collaboration were discussed. ICANN invites interested individuals and experts from its stakeholder groups to volunteer for the Task Force on Arabic Script Internationalized Domain Names (IDNs). Details. Dr. Sarmad Hussain will be presenting the Arabic Script Variant Issues as an Expert Panelist at the APRALO-ICANN Joint Workshop titled, “Next in IDNs: Linguistic Diversity in the Internet Root” to be held at the Internet Governance Forum, 2013 from 22nd – 25th October, 2013 at Bali, Indonesia. CLE organized the prize distribution ceremony of e-DirAP Forum Competition titled, “Smart, new ways in using the Internet to make higher education in Pakistan a more interesting and worthwhile learning experience” at Al-Khawarizmi Institute of Computer Sciences, UET, Lahore, on 6th June, 2013. This competition was jointly organized by CLE in collaboration with IEEE, UET Lahore’s students’ branch. Dr. Sarmad Hussain, conducted a seminar on Developing Standards and Linguistic Resources for Computational Research in Pakistani Languages at Riphah International University, Faisalabad on 25th May, 2013. Dr. Sarmad Hussain invited to present on Community Readiness for IDN Variant TLDs-Arabic Script Case at APRALO Multistakeholder Policy Roundtable in Beijing, China on 8 April 2013. Dr. Sarmad Hussain invited to present on ICANN Middle East Engagement Strategy at Arab Multi-stakeholder Internet Governance Meeting in Dubai on 3-5 March 2013. CLE is conducting a four months course on Spoken Urdu Certificate for Foreign Students enrolled in UET. Classes starting from 1st March, 2013, held on every Tuesday & Friday from 3:00 pm – 4:30 pm, at Seminar Hall, Al- Khawarizmi Institute of Computer Science. Mr. Saad Irtza, presented a paper on Minimally Balanced Corpus for Speech Recognition at 1st International Conference on Communications, Signal Processing, and their Applications (ICCSPA'13), held from 12-14 February, 2013 at Sharjah, UAE. 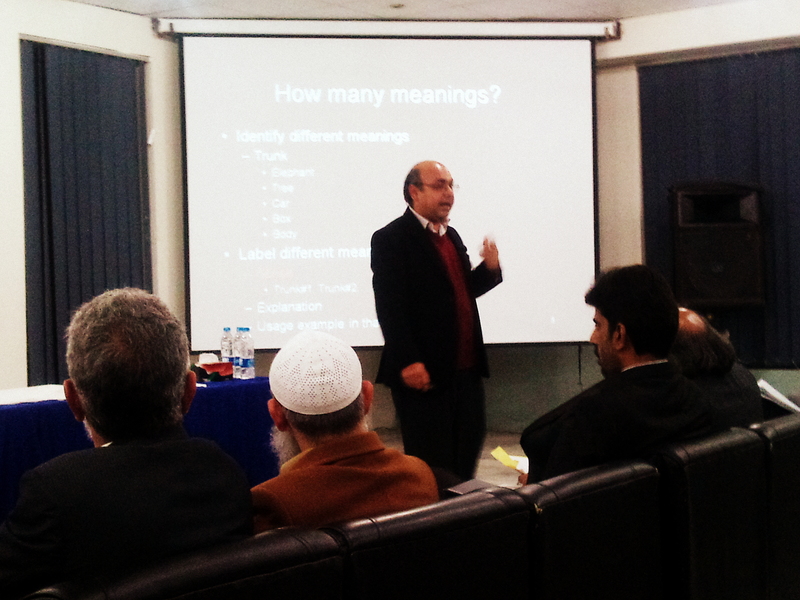 Dr. Sarmad Hussain, conducted a session on Developing Linguistic Resources for Languages in Pakistan at Beaconhouse National University (BNU), Lahore, Pakistan, held on 13 February, 2012. Dr. Sarmad Hussain, Dr. Tania Habib, Mr. Inamullah and Ms. Sana Shams presented research projects at the First Pakistan- ICTD Workshop 2013 at Lahore University of Management Sciences (LUMS), Lahore, on 15th-16th January, 2013. Dr. Sarmad Hussain, attended the Technical Committee meeting regarding the development of IDN ccTLD پاکستان. at Ministry of Information and Technology (MoIT), Islamabad, on 28th December, 2012. View Picture. Ms. Qurat-ul-Ain Akram conducted a workshop on Urdu Nastalique Optical Character Recognition and Mr. Naveed Ahmad presented on Urdu Nastalique Optical Character Recognition, at 2012 International Conference on Open Source Systems and Technologies (ICOSST 2012) held at Al-Khwarizmi Institute of Computer Science (KICS), University of Engineering & Technology Lahore (UET) Lahore, from 20th-22nd December, 2012. Dr. Sarmad Hussain, conducted a workshop on Urdu Nastalique Optical Character Recognition at 10th International Conference on Frontiers of Information Technology (FIT’ 12), held from 17-19 December, 2012 at Islamabad Pakistan. This conference was organized by the COMSATS Institute of Information Technology, CIIT. Pan Localization Network partners have organized The 10th Workshop on Asian Language Resources, held at Indian Institute of Technology, Mumbai, India on 9th December, 2012. Ms. Qurat-ul-Ain Akram conducted a workshop on Urdu Nastalique Optical Character Recognition and Mr. Saad Irtza demonstrated the project, Mobile based Online Weather System at the workshop on Context Aware Technologies for Assistive Robotics (CATAR 2012) held at Lahore University of Management Sciences, Lahore, on 7th December, 2012. Dr. Sarmad Hussain, conducted A Workshop on Translation and Technology at University of Gujrat (UoG), Gujrat on 3rd December, 2012. This conference was organized by the Center for Language and Translation Studies, UoG. View Details. Dr. Sarmad Hussain, conducted a seminar on Urdu Phonetics and Phonology at Kinnaird College for Women, Lahore on 27th November, 2012. The Urdu Linguistic Resources Development Project has been extended till 2013 by DAAD Germany. This project is a collaborative effort by CLE and University of Konstanz, Germany. The project focuses on the development of critical linguistic resources for Urdu to do grammatical and semantic analyses for further use in linguistics, psycholinguistic and computational work. 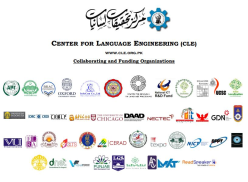 CLE is organizing the Conference on Language and Technology 2012 (CLT12) in collaboration with Society for Natural Language Processing, Pakistan (SNLP) at University of Engineering and Technology, Lahore from 9th to 10th November, 2012. CLT12 is funded by DAAD – German Academic Exchange Service with grants from the Federal Ministry of Education and Research. CLE has won a project titled 'Investigating the Long Term Residual Impact of ICT Integration across Gender for a Sustainable Project Design' in Global Research Competition 2012 organized by Global Development Network. It is an 18 months long project and the total grant amount is USD 32,000. CLE is co-organizing the International Summer School in Advanced Language Engineering in collaboration with University of Konstanz, Germany and Kathmandu University, Nepal, at Kathmandu University, Nepal from August 26-September 21, 2012. This Summer school is funded by DAAD – German Academic Exchange Service with grants from the Federal Ministry of Education and Research. CLE is conducting a Research Seminar Series on multidisciplinary topics related to Language Engineering on every Tuesday from 11:30 am – 12:30 pm, at Seminar Hall, Al- Khawarizmi Institute of Computer Science. Details. A delegation including the CEO, and Executive Director of a US based NGO; Children of Tomorrow visited CLE on 24th April 2012, to learn about CLE's current research on integration of ICTs in rural schools of Pakistan. CLE is organizing Third Workshop on Internationalized Domain Names for Local Content Development:Policy for ۔پاکستان IDN ccTLD on behalf of Ministry of IT (MoIT), Government of Pakistan, on 20-21 April, 2012, at CLE-KICS-UET. CLE had organized training on Optical Character Recognition (OCR) from 16th to 20th April, 2012, at Al-Khawarizmi Institute of Computer Science (KICS), University of Engineering and Technology (UET) Lahore. Details. An Urdu text corpus distribution agreement has been signed between Urdu Digest and Center for Language Engineering, Al-Khawarizmi Institute of Computer Science, University of Engineering and Technology, Lahore at a meeting in Lahore. Details. Mr. Qaisar Khalid Mahmood, Research Assistant, CLE and M. Phil Scholar, Institute of Social and Cultural Studies (ISCS), University of the Punjab, has presented research paper titled... Details. CLE team has participated in one day Symposium on Document Image Analysis held at LUMS, on 20th March, 2012. Head CLE, Dr. Sarmad Hussain, was the one of the speakers of the workshop. He talked on topic Challenges in Developing Urdu Nastaleeq OCR Systems. Mother Tongue and Heritage for Education and Research (MOTHER), a civil society organization, has been re-organized at a meeting in Islamabad. Representatives of 11 language communities attended the meeting and vowed to work together for upholding the cause of the organization. Details. The government of Khyber Pukhtunkhwa has decided to establish a Regional Languages Authority for the purpose of teaching and promotion of regional languages in the Province of the Khyber Pakhtunkhwa. A bill has already been passed in the KPK provincial assembly. 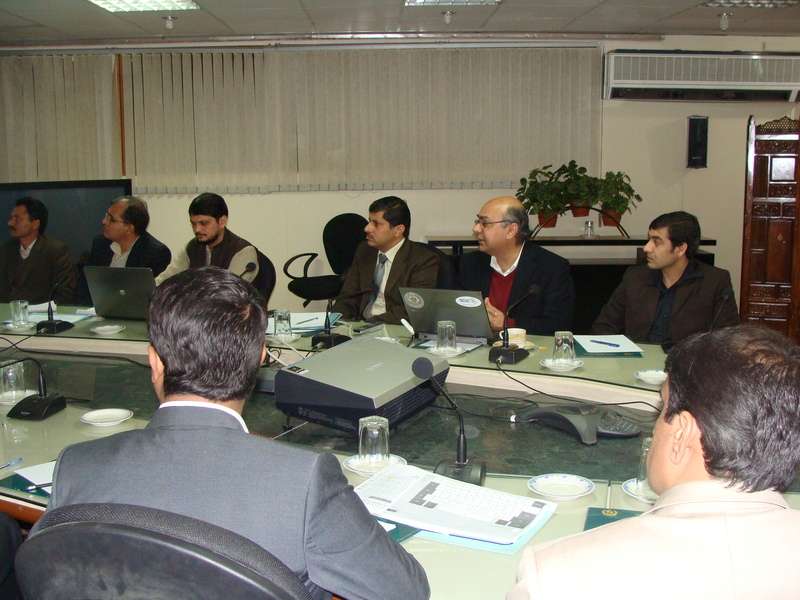 mLab project preparation meeting was held at CLE on 30th December, 2011. The meeting was attended by representatives from all the partner organizations including PSEB, KICS, NCA, Indus Valley and chaired by Zia Imran, Managing Director Pakistan Software Export Board. Details. Chairman National Language Authority Pakistan, Dr Anwaar Ahmed visited CLE on 28th December, 2011 along with the other dignitaries from universities including GCU, PU, BZU and NUML. Details. Dr. Tafseer Ahmed Khan, Post Doctorate Scholar, from Konstanz University, Germany visited CLE on 23th December, 2011 and discussed upcoming collaborative projects in detail. Admin and Accounts Staff, CLE attended the training on The World Bank Procurement and Implementation Issues, facilitated by Mr. Gurcharan Singh, Senior Procurement Specialist Transport, Water and Information Communication Technology (TWICT), World Bank on 3rd Jan, 2012 at Al-Khawarizmi Institute of Computer Science (KICS), UET, Lahore. Mr. Qaisar Khalid, Research Assistant , CLE and M.Phil student, Institute of Social and Cultural Studies ( ISCS), Punjab University, Lahore was nominated to attend... Details. Researchers at CLE contribute to the global efforts to deploy domain names in local languages. Dr. Sarmad Hussain has been a member of the WHOIS Review Team constituted by ICANN, and is one of the authors of its recently published WHOIS Review Draft Report, published for public comment. Details. Researchers at CLE contribute to the global efforts to deploy domain names in local languages on the Internet. Dr. Sarmad Hussain, the coordinator of the Arabic Script Case Study team for ICANN's TLD Variant Issues Project, and one of the author of Arabic Case Study Team Issues Report. Details. Researchers at CLE contribute to the global efforts to deploy domain names in local languages on the Internet. Dr. Sarmad Hussain (selected as the coordinator of the Arabic Script team) and Huda Sarfraz have been contributing to this effort as members of a global team working to identify relevant issues for languages using the Arabic script. More Details . The closing ceremony of Subh-e-Nau project was held on Thursday, 28th of April 2011 at APWA Punjab, Lahore to appreciate the efforts of the workshop participant and to view the digital stories. Conference on Human Lanaguage Technology for Development (HLTD 2011), jointly organized by PAN L10n, ANLoc and IDRC, will be held from 02 to 05 May, 2011 at Alexandria, Egypt. The Department of Information Technology and Telecom of Bhuttan (DITT), Al-Khawarizmi Institute of Computer Science, University of Engineering and Technology of Pakistan (KICS-UET), Language Technology Kendra of Nepal (LTK), ... Details. CLE launches Online Torwali Dictionary on 21st of Feb.2011. It is a collaborative effort of CLE, The Genographic Project of National Geographic and PAN Localization Project of International Development Research Centre, Canada. CLE is participating in Fourth International Conference on Open-Source Systems and Technologies (ICOSST-2010) organized by Al-Khawarizmi Institute of Computer Science (KICS). ICOSST-2010 will be held at KICS, University of Engineering & Technology (UET) on December 22-24, 2010. CLE is participating in 13th Sustainable Development Conference (SDC) organized by Sustainable Development Policy Institute (SDPI) from 21 to 23 December 2010 in Islamabad, Pakistan. This year’s Conference is titled ‘“Peace and Sustainable Development in South Asia: The Way Forward”. CLE is participating in International Conference on Frontiers of Information Technology 2010 organized by COMSATS from 21 to 23 December 2010 in Islamabad, Pakistan. CLE in collaboration with All Pakistan Women’s Association (APWA) has won TBTT Small Grants Award for conducting Subh-E-Nau project. In Pakistan the TBTT campaign is being spearheaded by BytesforAll and the Pakistan Software Houses Association for IT & ITES (P@SHA) with support from the Association for Progressive Communications Women's Network Support Program (APC WNSP). CLE is participating in 13th Oriental COCOSDA (The International Committee for the Co-ordination and Standardization of Speech Databases and Assessment Techniques) 2010. O-COCOSDA 2010 will be held at Kathmandu, Nepal on November 24-25, 2010. CLE in collaboration with Punjab Information Technology Board (PITB) has developed Urdu Language version of Punjab Government’s Flood Relief Website. CLE in collaboration with National Language Authority (NLA) is organizing Conference on Language and Technology 2010 (CLT10). CLT10 will be held at National Language Authority (NLA), Islamabad on October 23, 2010.